Just like dull scissors on hair, worn-down lawn mower blades will damage the ends of your grass. If you want your lawn to keep looking its best, you need to use sharp blades. But not all of them are top quality. We’ll review the best lawn mower blades for some of the most popular mowers on the market. Most homeowners will want to sharpen their mower’s blades about once every couple of months during the prime mowing season. If a blade has dents, bends, or nicks, change it before mowing. A damaged blade is dangerous to you, your mower, and your lawn. After you mow the grass, inspect it. Is the cut uneven or ragged? Did you have to make several passes to make it look right? Are the tips ragged or torn? You probably have a dull blade. While we’re covering replacement lawn mower blades in this article, you can typically sharpen your original blade several times before it wears too thin and must be replaced. Many owners buy an extra set to sharpen and have on hand. Then all they have to do is swap if there’s a problem. If you’ve not replaced your own mower blades before, it’s pretty easy to do. It might save you some money to try it at home. But please do follow a few safety steps. DISCONNECT THE SPARK PLUG. Yes, it’s in all caps because it’s that important. You really don’t want your mower to start up by accident while you’re dealing with the blade. Wear gloves. Choose a nice sturdy pair. You want those hands for other activities, right? Block the blade. Use a piece of wood to stop the blade from turning while you loosen the bolts. Okay, you’ve seen the public safety announcement. Now here are ten easy steps to changing your mower blade. Consult your owner manual for how they recommend changing a blade. Empty fuel. This makes the mower lighter and you have less chance of spilling it over essential things like the air filter. When you lift or tilt the mower, tip it so that the fuel and oil tanks do not spill over the carburetor. Models differ, so this may mean leaning it on its side or laying it down back towards the handle. If it’s a riding mower, use a lift, a ramp, or a jack that’s made for that kind of machinery. Line up any washers or nuts and mount the new blade in the correct direction. This is the trickiest part because you need to tighten it without over-tightening. Too much torque may mean it will warp or vibrate. Nothing should wobble when you’re done. Put the mower back down on its wheels and go take a break while the oil or fuel trickle back into their proper places (just in case). Give it about a half hour. Check the air filter to make sure it didn’t get wet. Then check fluids, fill the gas tank, and attach the spark plug. Start it up—does it seem okay? Test mow an area. If all goes well, you’re good to mow. That doesn’t sound too bad, does it? Now let’s look at the best blades for walk behind lawn mowers. We’ll begin by reviewing the top lawn mower blades in order of blade length. Greenworks makes electric corded and cordless mowers that are very popular sellers these days. This blade is OEM (original equipment from the manufacturer) which means it is the same as the one that came on your Greenworks mower if you have the 25142 or the 25322. You may also be able to mount this blade on other 16-inch mowers from other companies like Kobalt or Ryobi. This is a steel blade made for general-purpose bagging and discharging. Similar to the blade above, this is an OEM part made from heat-treated steel. It’s 20-inches long and are made for Greenworks mowers 25022 and 25222. These blades are best for general-purpose mowing, not mulching. You’ll need a 15mm socket wrench to remove your old blade and install this one. Maxpower has a lineup of non-OEM replacement blades that fit a wide variety of mowers from several manufacturers. This 20-inch-long blade is 2.25 inches wide and is made for bagging and discharging. It has a 1-inch center hole and comes with a selection of washers so that you can adapt it to your mower. The reducing washers are in these sizes: 3/8-inch, 7/8-inch, 9/16-inch, 5/8-inch and 13/16-inch. The blade should fit on models made by AYP, MTD, Murray, Sears, Snapper, and on some Lawn Boys. Check with the vendor to make sure they will fit your model if it’s not listed on the page. If you have a 21-inch mower and you like to mulch, check out this MaxPower blade. It’s commercial grade to tackle tough mulching jobs with both grass and leaves. The blade is shaped with gator teeth to give better lift. It has a 1-inch center hole and comes with reducing washers in these sizes: 3/8-inch, 7/16-inch, 9/16-inch, 1/2-inch, 5/8-inch, and 13/16-inch. If you have a 21-inch Honda mower in the HRX217 or the HRR216 series, chances are that these replacement blades made by Honda will fit. These are part of the two-blade Micro-Cut system. You’ll need to install both of them at once to replace your old set. 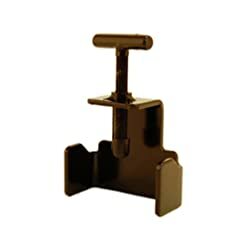 These rugged blades will endure sharpening several times before they need to be replaced. They are great for both regular mowing and mulching. Husqvarna is the company that owns Poulan so this 22-inch replacement blade works on both brands of mowers. It will also fit many Craftsman, Roper, and Weed Eater machines. This is an OEM part backed by a 1-year warranty. It measures 2.25-inches wide by 22 inches long and comes pre-sharpened and ready to use. Here is another commercial-grade mulching blade from MaxPower. It’s made for 22-inch mowers from Husqvarna, Poulan, and Craftsman. Users that are pleased with this replacement have said that it is less expensive and works better than OEM blades. If you have a riding mower or a lawn tractor, you still need to sharpen and replace blades. Many times these machines have dual or triple blades that must all be replaced at once. Here are the top ones to use. 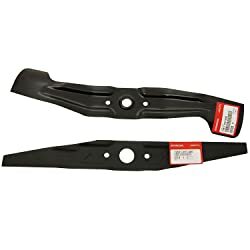 If you have a 42-inch deck on your Poulan, Poulan Pro, AYP, or Craftsman mower, you may appreciate this set of two blades from Stens. They are 21-inches long, 2.24 inches wide, and 0.134-inch thick. They have a 5-point center hole for installation. Don’t be fooled by the painted finish. They may look dull because of the protective coat, but they are sharp and ready to cut your grass right out of the package. Mr Mower sells these universal mulching blades that fit on several models of riding mowers. If you have a AYP, Sears Craftsman, Husqvarna, or Poulan, they could save you money over OEM parts. The blades are 21-inches long, 2.25-inches wide, and 0.140-inch thick with a 5-point center hole. Mr Mower points out that their dual bevel design makes for more efficient mulching. If you’re driving a 46-inch Troy-Bilt, Cub Cadet, or MTD mower, take a look at these rugged blades from MaxPower. They have a 6-point center hole for easy adaptability. They measure 23-1/2-inches in length. 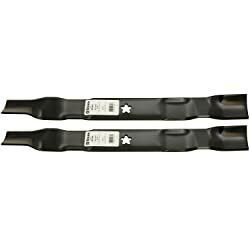 These universal replacement blades for Craftsman, Poulan, and Husqvarna 48-inch mowers are ideal for bagging and side discharge mowing, but not for mulching. They come in a set of three for rotary decks. Each blade is 16.75-inches long, 2.5-inches wide, and 0.204-inch thick. Oregon makes these popular gator mulcher blades to fit 54-inch Craftsman, Poulan Pro, and Husqvarna mowers. Each blade is 18.5-inches long, 2.5-inches wide, and 0.187-inch thick. They have the distinctive “gator teeth” that give more lift for better mulching. Each blade is heat-treated for longest life. Satisfied owners have said that these Gator Blades are thicker and heavier than the OEM parts that came with their mowers. As a a result of installing them, they have noticed that their mowers are able to pick up more debris for mulching and expel clippings farther than before. When it’s time to remove, sharpen, or replace your lawn mowers blades, it helps to have the right tools on hand. Here are some that will make the job easier. The Arnold Blade Removal Tool is designed to help you take blades off walk behind or riding lawn mowers. It doesn’t matter if you have single or dual blade edges. It holds the blade in place while you unbolt it. Beats hunting down a stray scrap of wood to jam in the mower and much safer than having someone hold the blade for you. From the same company as the removal tool above comes the Blade Balancer and Sharpener Kit. If you plan to sharpen your own blades, a balancer is a big help. The balancer works for both round hole and star hole blades. You can see right off if the blade is ready to use or needs more refinement. The sharpener disk works in most drills so you can quickly put an edge on your blades. If you have an angle grinder, you may prefer to use that instead of the sharpener. But the sharpener beats filing by hand. We haven’t said much about reel mowers because their blades typically don’t need replacing for years. But you will want to sharpen them once in a while. Use this kit from Fiskars for an easy way to touch up the edges. Protect your hands with durable, comfortable work gloves. This pair of Ranchworx from Ironclad is made from Bullwhip leather and Kevlar to keep you safe. They are machine-washable, too. If you don’t have a socket wrench set, you’ll need one for blade changes. This kit from Stanley has about every size you can imagine. Even better, all the pieces are very clearly labeled in black and silver with laser etching. The case may be headed for the recycle bin, but the tools themselves are top notch. If you don’t want an entire set, check out this universal socket wrench. The hardened steel pins inside the head adapt to bolts and screws from 7mm up to 19mm in size. Now that you’ve seen the top products for replacing your mower blades, let’s take a look at what you can do to rescue a badly cut lawn. First, just like a bad haircut, the lawn needs time to grow. It may take a week or two before it begins to look normal again. Once you have your new blades on your mower, your next cut will look a lot better. In the meantime, check your grass height and your mower deck height. Are you scalping the grass? Follow landscaper recommendations for your type of lawn grass. Second, make sure you’re watering enough but not too much. Avoid watering in the hot sunshine or in the middle of the night. Instead, try to do it in the early morning. Use a timer. To see if the grass is too dry, step on it and see how long it takes to spring up again. If it stays flat, it’s too dry. You can also sink a screwdriver into the ground to see how deep the moisture goes into the soil. If you can’t push the screwdriver in very far, your ground is probably too dry. Of course, over-watered grass will feel marshy and may yellow. Third, try to let the grass rest while it’s recovering. Don’t walk on it or park on it. Don’t rake it unless you must. Fourth, if you need to wait a few extra days for it to grow back to a proper height, that’s best. Try to never cut off more than one-third of its height at a time. If you see that your grass is yellowing, this could be due to various factors. Ragged cuts can burn the tops of the grass. Over and under-watering and parasites and disease can cause yellowing, too. See if you can narrow down the problem. Stay on top of regular blade maintenance for the best looking lawn possible. Once you remove the blade, inspect it for damage. If it’s badly nicked, dented, or bent, just replace it and recycle the old one. If it is just dull, you can put a new edge on it with a metal file, a grinding tool, or a sharpening stone. Sharpen one side, then the other, and try to do the same for both. Use the balancer to see if you got it right. The heavier side may need some more filing. Then mount your blade and give it a test. In case this sounds like too much work, there are many shops that can sharpen blades for you. If you remove the blades from the mower yourself, you’ll save money on labor costs. We hope this article helped you find the perfect lawn mower blades for your mower. Check back soon for more reviews on the best products!